I have just had a couple of days over in Wales. I started my tour by heading over to Drover Cycles at Hay-on-Wye. The famous book town is quite interesting to get to as there is no direct route, but the weather was good and the trees were glorious making the journey very enjoyable. Anna and Luke were having a very busy morning with filming and still photography going on as part of a project to promote tourism in the area. 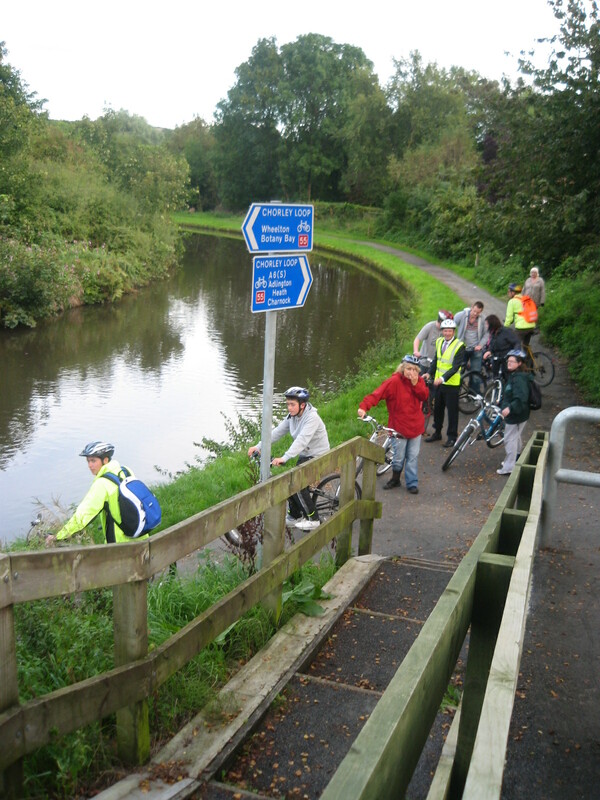 The promotion included walking as well as cycling and cycle touring. Drover Cycles have a hire fleet including electric bikes and also arrange cycle tours. I took the opportunity to grab a couple of pictures while I was there too. After that I was off over the Brecon Beacons to South Wales. The trees were stunning but there just wasn't the right place to park to get any decent pictures. The autumn colours combined with the hills made it a lovely trip. It was great to pop in to Ray Williams Motorcycles in Llanelli, the guys there gave me a lovely welcome and were pleased to see the new folder "The Dash". The sun was still peeping occasionally as I headed off to visit a couple of potential new dealers. Then it was onto the M4 for a very motorway based return journey. The weather closed in, and there was quite a lot of torrential rain as I listened to the dismal traffic reports. When the traffic lady concluded with "I don't even want to talk about the M25" and then didn't! I knew I was heading for trouble. Luckily the accident cleared and the motorway was open again by the time I got there, so things weren't as bad as they initially seemed. All in all a very nice 'Dash' to Wales! The Motorhome and Caravan Show at the NEC in October is always a big event for us, six days of talking to lots of lovely people about electric bikes. This year we also had our brand new model, the folding Dash, for sale for the very first time. 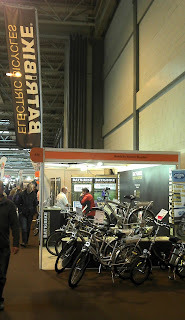 We were able to put up our new stand again, which we had used previously at the Cycle Show just one week before. This time we displayed a folded Breeze on the central podium, giving everyone the chance to see how well it folds. 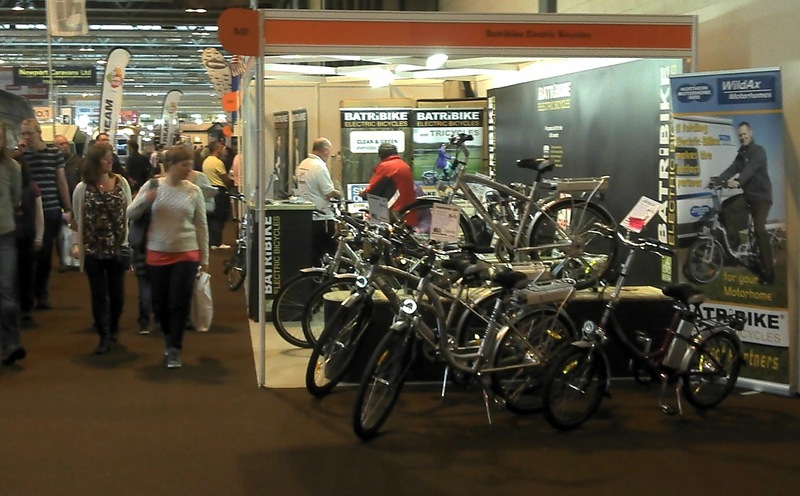 Usually when we have a folded bike on the stand it is on the floor and gets a bit overlooked. Putting this one above the ground certainly created more interest. Being next to one of the hall entrances meant we were busy right from the the time the show opened at ten until it closed at six. It was also quite difficult to get off the stand to take pictures, I would love to have had some when the stand was so busy we could hardly move, but obviously I can't just say "Can't talk now, got to take some snaps!" So the two pictures I have are the best I could manage with my phone in a brief respite. I really enjoy being at this show because of the sheer volume of visitors that we get the chance to speak to. From existing customers that have come to see whats new or just to tell us where they have been on their bikes, to couples who have just started to look for their first motorhome and want to know about the benefits of electric bikes. It is really nice to be able to spend time discussing how best to carry your electric bike, fully integrated rack, tow ball mounted rack, folded into a locker, stored in the living space of motorhome or caravan or in the boot of the car, the choice is huge. At the end of the day it comes down to how much and where you want to use your electric bike. It is always worth considering if you would use your electric bike more if you could take it out for the day from home. Rather than having to use the motorhome to transport the bikes it might be useful to be able to fold the bikes to put them in the boot of the car. Going out for the day from home can feel just as much like a holiday as a week away. A trip along one of the disused railway line cycle trails, a ride along the seafront or an outing following some forest trails can be really refreshing. Especially if you can find one of those gloriously sunny days that suddenly arrive amid gloomier weather. 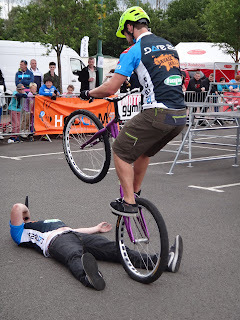 The excitement that is the Cycle Show has come and gone and I'm only just getting round to my blog. we are launching a new folding electric bike, the Dash, at the Motorhome Show at the NEC next week so things have been busy. The Cycle Show was great, we had loads of good comments about our new stand design, we loved the way the new podiums showed of the bikes. Having them raised of the ground it made the frames very much more tactile - they generally don't get stroked that much when they are displayed at floor level! I didn't get much chance to look round the show but I did manage to grab a few photos of different or remarkable stands. Interesting to see a car at the show - even if it was a Lotus! Great to see the St John Ambulance response cycles. Even the chairs on their stand were Hi Vis! How tall is this bike! I guess you have to dismount when you stop. Or look for a lamp post to lean on. When I have been out and about lately I have seen a few interesting bicycles, I thought I would gather them all together here. This nice 1920's Railwaymans bicycle was propped at the side of one of the engine sheds on the North York Moors Railway. This is a tricycle inspection trolley used up until 1982 on the Norwegian State Railways. It is capable of speeds up to 20mph and was used for spotting track defects. It is a lot more primitive than the Batribike Trike which is capable of speeds up to 15 mph under motor assistance. We recommend using the Batribike Trike on roads and cycleways though rather than on rails! To round of my collection of interesting bikes, a boneshaker. Legend has it that it was built by a gentleman to visit his sweetheart. I wonder what she thought when she saw him coming up the road on this novel new means of transport. Electric Bikes Cross the Tracks! It's a lovely sunny day here in Lincolnshire so I have been out on a test ride with our new trainee. I was demonstrating to him how brilliant electric bikes are at assisting you on hills. Our local 'hill' is a 1:10 with a 1:8 kick at the top, which is quite hard work for the average cyclist on a non assisted bike. The hill starts at a junction so you are nearly always coming at it from a standstill or very low speed which is never good for hills as a bit of momentum really helps. We negotiated the hill easily! We tried different levels of assistance and different gears and proved to ourselves that even a mid level of assistance made the hill easy to negotiate without straining our legs. Cycling back to base we came to a level crossing which closed its gates as we approached. The crossing is on a rural roman road so you can see the crossing from a long way back. As we waited the man in the signal box was calling to me, I couldn't quite hear what he was saying so crossed the road. He said that if we wanted to continue we could go through the passenger gate and cross the track! I was a bit concerned and asked if a train was coming, but he said that it was fine to cross. I have to say we hustled across quickly and were way up the road before the cars behind caught us! I was riding the new Batribike Diamond XL which along with the Granite XL has been designed for the taller rider. Having somewhat longer legs myself I found it very comfortable to ride and the 700c (28") wheels helped to cover the ground well. It seems that now we are into September, even though we haven't had much of a summer, Autumn could be on its way, the hedgerows were quite well laden with hips and haws, and I even found a walnut. What a brilliant day to be out riding - and it was work too! While I have been out and about lately I have seen a couple of interesting bikes that prompted me to take pictures of them. The first was in lovely sunny conditions in a garden leading down to the waters edge on the Norfolk Broads. A rather excellent full size garden ornament with planters full of flowers. 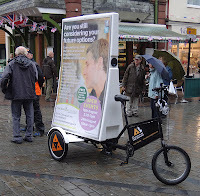 The second was an advertising bike, actually a tricycle, with an advertising hoarding on the back, in the same style as the van type ones you see randomly parked on verges. This one was located at the end of the market square in a somewhat drizzly Keswick. The advertising bike got me thinking about utility bikes in general. Electric bikes are ideally suited to load carrying (or pulling). One of our customers uses his Batribike Diamond to pull a trailer to his allotment carrying his tools on the way there and adding his produce on the way back. I can just imagine him with a trailer full of marrows and a pumpkin. When we were at the Shrewsbury Bike Fest we were parked next to the lovely people from Riders. I hadn't heard of the charity before and was intrigued as to what it was. The charity raises funds for health workers in Africa to have transport - mostly motorbikes. To achieve this they run expeditions so that motorbike riders can experience a ride of a lifetime across Zambia. But at the same time they are supporting the work of the charity. Sounds exciting! We had rather a busy week last week. On Wednesday we headed out to the Mobility Roadshow at the East of England Showground at Peterborough. The weather had improved and we were looking forward to the three day show. We got the show van into position in the bike fest area when we arrived, positioning very carefully against the tarmac as Ralph pointed out that the grass area was lower - and you never know! Unfortunately it then proceeded to rain all night which meant that the campsite was flooded in the morning. I'm pleased to say that the weather did not deter the visitors, and the bike area proved popular. The wind gained in strength during Friday and by the end of the day many stand were hanging on to their shelters. In fact when we arrived Saturday morning the gazebos opposite had decided to lay on their backs and play dead. Luckily all our equipment stayed intact. 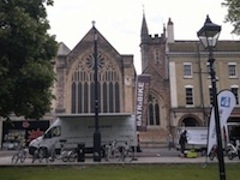 As soon as we were packed up on Saturday evening it was time to head over to Shrewsbury to the Bike Fest 2012. The weather was a little chilly Sunday morning but dry, yay! 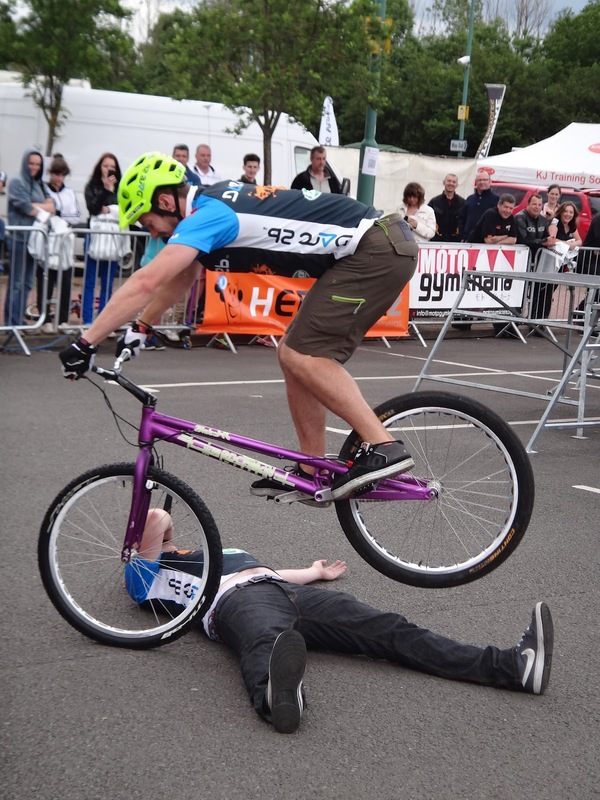 Bike Fest is organised by Shropshire Motorcycle Road Safety Group and as you would expect was principally about road safety. It was also aimed at motorcyclists but there was lots of interest in Electric Bikes. All the test riders were impressed with the amount of assistance the bikes could give and had that "electric bike grin" after their test rides. The event was free to visitors and there was plenty for them to see with loads of motorbikes on display and the Savage Skills bicycle team put in two stints in the arena. The event was also raising money for the local Air Ambulance, I understand the total raised was around £1800. Colin Young from BBC Radio Shropshire was there introducing the arena events and taking a look round the show. "I'm not really a motorcyclist" he confided. "But these electric bikes look much more like the thing for me". I explained how they worked and what the benefits were. Then he asked if he could interview me for his radio programme. The interview went out on air just after 2.00 p.m. on Monday. The afternoon was a lot brighter than it had been for several days so I got snapping with the camera and have included several, especially of the Savage Skills guys who looked as if they had some sort of death wish! There have been many events around the country to promote being environmentally friendly during Green Week. 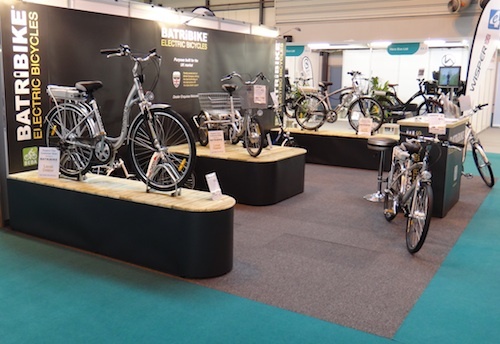 We at Batribike Electric Bikes were delighted to be able to attend two of them over the weekend. We were at the London Green Fair on Saturday and Sunday and at the Big Green Event in Bristol on Sunday. All set up amid the Bristol Architecture. Considering how the weather has been just lately I was seriously concerned that the events might be a washout. Thankfully there was a huge improvement and Saturday dawned bright and clear for the trip to London. In fact the sun shone and we were even at risk of sunburn! Sunday remained dry too even feeling a little warmer than of late. The crowds in London's Regents Park were treated to a festival of free music and green events many enjoying the opportunity to sit in the sun and have a picnic. I took the opportunity to have a quick ride and take in the scenery of the great park. 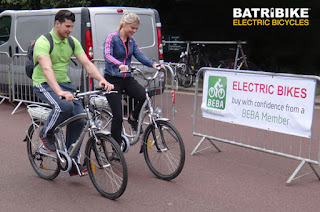 The Electric Bike Fest area was sponsored by BEBA (The British Electric Bicycle Association). BEBA members and non-members displayed a vast array of electric bikes of varying styles and retail prices. A test track had been set up in Chester Road between the Inner and Outer Circle roads where Green Fair visitors could test ride electric bikes in a traffic free environment. We were very busy both days in London and in Bristol showing people how the bikes work and watching them enjoy the excitement of their first 'assisted' ride. There was also the opportunity to discuss how electric bikes fit within the Green Week ethos. It seemed that some thought that we were trying to get dedicated cyclists off conventional bikes and onto electric. Once they understood that it is all about making cycling more inclusive, getting people onto bicycles who would otherwise perhaps use a car or to help people cycle further than they would on a conventional cycle, everyone agreed that electric bikes have a big part to play in improving the environment. Batribike has been out and about in the South West for the last two days. A large delivery of bikes at the warehouse on Monday gave us the opportunity to go out and visit some of our dealers and deliver some bikes as well. The weather yesterday was superb as we headed out from the workshop near Lincoln. Our first visit was to PowaRider in Cheltenham. It was good to travel out on the A46 from Newark we having been watching the revamp going on on this particular road for a couple of years. Initially I was quite upset by the number of trees they had to pull down to accommodate the widening scheme. Now the road is finished and with the banks all green and lots of new trees planted it is really a good route across country. Second stop, E-Motion at Swindon, with the sun shining it was a good photo opportunity. And so on to Bath to Take Charge. This was the first time I had been to the new premises (they have actually been there a while now!) The new position is really accessible with a hill right outside the door to give customers a good change to try the bikes. Unfortunately it was rush hour as we left Bath and we got stuck in the inevitable traffic jam, but the views were worth it! The sun was shining again this morning at the first stop of the day, Axcess electric bikes in Honiton. Final stop of the tour PowaRider in Woking. Off home now ready for a busy day in London tomorrow. Transport Extra is today leading with the story of the new duty to compel councils to deliver walking and cycle routes. Electric bikes can make a huge difference to the distance considered by riders as feasible for commuting or other daily rides but the safety of cycling routes can often be a barrier. This could all change as new legislative plans published this week by the Welsh Government mean that local authorities in Wales are likely to become the first in the UK to have a duty to deliver a network of walking and cycling routes. Developing and maintaining safe cycle routes is to be made a legal obligation. The Active Travel (Wales) Bill will not become law until the end of 2013 but it is already causing quite a stir. Cycling groups are delighted by the proactive stance taken by the Welsh Assembly and there have been calls to the English and Scottish parliaments to follow suit. Safer cycling routes across the UK would prompt more people to get out on a bicycle for everyday journeys. Safety concerns are often a barrier to cycling as an alternative to other means of transport. The rain stayed away as electric bikes wowed visitors to Great Yarmouth's Golden Mile today. The rally was the brain child of The Electric Bike Shop (Transport Electric UK) who are based just up the road in Gorleston-on-Sea. Eleven electric bike manufacturers from all around the UK brought demonstration bikes for visitors to test ride. Here we are all set up and waiting for the event to start. We were delighted to be part of the event and were once again amazed by the level of interest in the Trike. The Mayor and Mayoress of Great Yarmouth attended the event and headed straight for the Batribike stand. We were delighted when Mayor Barry Coleman was keen to take a test ride. As always we are keen advocates of safer cycling and were happy to help him fit the cycle helmet properly. The Mayor enjoyed his ride around the Landau Plaza on our Granite electric bike. A horse drawn Landau on the new dedicated cycle and landau lane along the seafront. Btribike electric bikes are now available from Ucycle2 based in a rural location near Chorley in Lancashire. Whether you are looking for a new electric bike for commuting or leisure use or just want to hire a bike for a leisurely ride round the Chorley Loop cycle trail Ucycle2 electric bike specialists are happy to discuss your requirements. Batribike are delighted to announce their electric bikes are now available from Philip Lang Cycles in Glasgow. Philip Lang Cycles is a family business that was established in 1966, they stock a wide range of bicycles at their extensive premises near the famous Barras market in Glasgow City. They have even persuaded the council to put in cycle parking just outside the shop! Glasgow City Council is an active supporter of cycling with a ten year plan to significantly improve cycling in the City with a network of cycle paths and routes suitable for all users. Electric bikes are classified as 'bicycles' and as such can legally use all cycle routes and paths. The Batribike Quartz electric bike standing by the cycle parking outside Philip Lang Cycles. BEBA, the British Electric Bicycle Association, is currently undertaking a large survey of electric bike usage within the UK. This important survey will be instrumental in the future development of electric bikes within the UK. The survey does not collect or hold any personal information.